A lot has changed about Ripple since this article was published in May of 2017. Since then, I have updated my thoughts and released them in a blog post for Hackernoon. As many of you have likely noticed, Ripple has skyrocketed in value, becoming the 2nd most valuable cryptocurrency by market cap (reaching close to $9 Billion this morning). However, it seems that many people treat Ripple like any other cryptocurrency, like Bitcoin and Ethereum. This fundamentally misunderstands why Ripple was created and how it should be used. In this blog post, I want to state how Ripple is different and give a recommendation for future use (spoiler: don’t invest). Ripple is not an Open Blockchain. Individuals can’t get full access to the Ripple Network. Unlike Bitcoin, Ethereum, Litecoin and 90% of all cryptocurrency blockchains, Ripple is a relatively closed blockchain. Through some effort, users can go download a wallet and transfer Ripple to it, but you have to create trust lines with other organizations in order to get access. In this way, you can’t just send money to whomever you want, they have to accept you as trustworthy before allowing transactions. And considering most users are banks, they have no reason to accept you. The reason for this is because Ripple is designed to take real world asset and transfer them to the Ripple Network. This is done through a process known as ‘issuance’, where a bank will create a transaction that adds the real world asset to the Ripple Blockchain. They can then trade these issuances with other Ripple 3rd parties, taking advantage of the low cost of transacting on the blockchain. The reason for these trust lines is because issuances hold very real value. If I have an issuance for a pound of gold, the other parties trust that I actually have this asset. If a malicious 3rd part creates a fake issuance, it will be treated as real. Even one instance of a fake issuance can break the trust of the system and collapse the network. Because of this, Ripple is a blockchain for banks, primarily focused on B2B. Normal consumers are not supposed to interact with the system and have better alternatives available. When Bitcoin and Ethereum were originally created, their cryptocurrencies, BTC and ETH, were designed to be stores of value. When you created a transaction, you were sending a store of value to another account (for payment for goods and services). Miners created nodes on the network to process transactions and were compensated with this cryptocurrency, either through fees or mining rewards. This is not how Ripple works. XRP was mined all at once by the parent company, with a majority of the cryptocurrency held by them. When a transaction is made on the XRP network, there is a fee paid in XRP, but this is not compensation. All transaction fees are ‘irrevocably destroyed’, not being paid to any members. XRP was created as an anti-spam measure to make it costly for people to spam the network with transactions. All XRP was created to be destroyed and if the network lives long enough, will be destroyed. This is in contrast with BTC and ETH, which are specifically designed to be long-term stores of value. While XRP does seem to have an incentive around trading (as state here), the ultimate point of XRP is to be burned, not held. You can read more about transaction fees here. Private exchanges and liquidity providers may choose to hold additional XRP for trading. Ripple (the company) does not promote XRP as a speculative investment. XRP has unique properties and a special use case that does not fit into the traditional cryptocurrency paradigm. The majority of the currency is controlled by the Ripple Foundation and while they absolutely have the option to sell of their share for a quick profit, this goes against the goals of the organization and their mission. One thing I am not certain of is why the cryptocurrency is allowed in exchanges in the first place. If you have ideas about that, please comment on this post, as I have not found any research explaining that decision one way or another. This article is not intended to be a defense of Ripple and their practices, but an explanation of why Ripple is different from traditional cryptocurrencies. Because the Ripple organization is such a heavy holder of XRP with unknown goals, it’s highly speculative on how the cryptocurrency is going to be valued in the years to come. Here’s another way to think about XRP: Ripple owns the vast majority of the XRP (over 60% of the supply). They can decide to cash in on the value, or completely devalue the market by flooding it with cheap XRP. At this point, we don’t know what they’ll do with this high valuation, but regardless, you are at the whim of a powerful 3rd party with uncertain goals. And more importantly, they’re telling you the currency is not good for speculation. For long-term holding, this is a deal breaker, particularly in a market with so many good options. VariabL is one of the first decentralized derivatives platforms being built on the Ethereum network. It is being developed by the StabL team working as part of Consensys. A few weeks ago, they launched their first version of VariabL and I got to try the platform during their first Beta round. Here are four things I learned while testing VariabL during Round 1 of the Beta. The price of Ethereum is Super Volatile… and for VariabL Users, that’s a good thing! VariabL works by offering a users a series of orders that they can choose to participate in. In a way, you can think of them like normal derivatives products, where you bet on the price of an asset going up up or down within the given time period. Currently, there are four products being offered in the beta, allowing for 4x/2x long and 4x/2x short on the price of Ethereum. For the purposes of the beta, the team is using a test network and giving 100 testETH to users who participate. Over the course of the first beta, there were about 2,000 transactions made. The winner in that time period was able to make over 70 ETH by correctly timing the market. If this were real money (and very soon, it will be), that would equate to $3,500. This volatility makes blockchain based derivatives an exciting platform to be apart of. In order to place bets in this platform, you have to execute specific contracts against the Ethereum blockchain. Fortunately, all of these processes are handled through the web interface, so you just have to decide how much money you want to make. Until the transaction needs to be executed. This is when Metamask comes in handy. Metamask is a chrome extension that not only acts as a light Ethereum wallet, but also allows you to send transactions to the blockchain. In this case, the UI created the contract that would become your derivatives order, and then an interface came up to confirm the order. This was very easy to use and allowed for me to give the ‘final say’ on whether a contract would go through. I can see most, if not all, Dapps in the next few years being run via Metamask as the ease of use was impressive. At one point during the beta test, I decided to check my account to see how my activity was when the site just stopped working on me. I contacted support and did some basic troubleshooting to see what the issue was. After finding some weird port issues from the console, I decided to get out of my office building and go to a Starbucks. I went back to the site and it worked just fine. It turns out the network wifi blocked the port used by blockchains, thus shutting down my access. This is just one of the many structural issues that will happen as blockchain integrates into society causing these early growing pains. Having issues is to be expected, but the way they impact your applications will be completely unexpected. If you’re building new blockchain apps, it will happen to you! During my discussion about my port issue, I got connected with Antoine Estienne, a blockchain developer working on VariabL. Through StabL’s slack channel, we worked through a couple of issues with the site. Hadrien Charlanes, the CEO of StabL, even jumped onto the conversation to help with some of the issues. During the beta, they were 100% accessible and were even joking around with the testers. This is not uncommon for Ethereum. If you go on reddit, you can see the founder of the Ethereum blockchain, Vitalik Buterin, answer questions directly from the community just like any other user. If you have questions, you can get them right from the source. It’s hard to find any tech community where you can reach out to the founders of the industry and expect a response. It’s truly something special. Round 2 of the VariabL beta test is about to begin, and there have already been significant changes made to the site. You check out the site at http://variabl.io and see the site for yourself. If you’re interested in joining, more beta test will come out in the future, so sign up for VariabL’s email list and join in! Update 5/11/2017: In the original version of this article, I stated that VariabL was the first decentralized trading platform. However, this may not be true. Projects such as etheropt (https://etheropt.github.io/) have existed before VariabL, with reports of an early derivatives platform existing as early as two years ago. Most were basic in functionality or were not entirely functional in some cases. This article has been altered to reflect this new infromation. Edit: Thank you for users joseph, vincent and simonp on the STABLteam slack channel for info on other trading platforms. The other day, I got a chance to see how slow technology moves despite our best efforts. 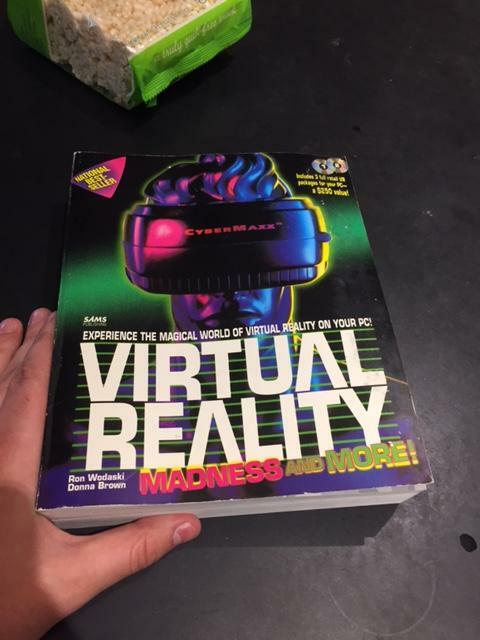 I was on a client site when I saw a large book with ‘Virtual Reality’ written in the spine. Thinking this had something to do with the Vive or Oculus (two of the most popular VR platforms today), I picked it up. Does this cover look like it was designed this decade? I didn’t think so. I flipped to the inside cover and saw the published year: 1994. For those of you not familiar, Virtual Reality was a set of technologies that has recently gained consumer traction. It was only with the Oculus Rift (launch in 2013 for developers) that the reality caught up to the vision. Before then, the technology was not advanced enough to be effective. That was 19 years after this book was published. If you were a hardware engineer or software developer, this might have been an interesting introduction to VR. But what if you were an entrepreneur, trying to create a company to capitalize on this new technology? Or an investor looking for a moonshot industry to be apart of? Can you imagine the disappointment and frustration of starting a VR company in 1994, when the first successful organization was 20 years away? Most entrepreneurs worry about being too late, but if started a virtual reality company in the 90’s you had the opposite problem: being too early. This is an important lesson for anyone interested in the blockchain technology. The value of blockchain and cryptocurrency is incredible and inevitable. I’m certain of this. But the underlying technology is still new. The most successful companies are working as exchanges (servicing investors), hardware manufacturers (for miners) or building out critical infrastructure that’s less about making a profit and more about making the ecosystem work. Where are the Facebook’s and Google’s of the blockchain world? They don’t exist yet! We can’t even be certain that the current ‘winners’ are going to exist in five years. It’s likely that the first crest of big successes (using adoption metrics, not fundraising) are at least 3-5 years away. If you are a low level developer or have worked in fintech for many years, this is a great time for you to enter the industry. There’s a lot of specialized infrastructure that needs to be built. But for most developers, entrepreneurs and other professionals, the opportunities will be fruitful, much like trying to be a Virtual Reality entrepreneur in 1994. You may be interested in Blockchain technology and how this fits into the larger world we live it. To you, we hope to act as a guide, helping you find the best resources and the clearest information on blockchain technology. Part of what we hope to offer is not just what blockchain is all about, but help you understand when you should get more serious about the technology. Many of the biggest thought leaders and developers in blockchain today had periods of either low engagement or complete disengagement after learning about this technology. They only decided to enter after understanding the technology and where they could make an impact. There is absolutely nothing wrong with dipping your toes in the water and waiting to dive in. But before you can know when you can make an impact, you have to know what this area is about. You can start this search by signing up for the newsletter. You will be sent a list of the three best books on getting up to speed on blockchain technology. After signing up, we will send you the top articles, blogs and industry trends so you be better equipped to understand this industry. This industry will eventually need the best minds of all fields and Hivergent is here to prepare you.